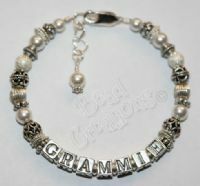 Gorgeous 1 strand Sterling Silver Bracelet & 6mm White Swarovski Pearls. Priced w/ 7 letters. Dangle not included in price but can added below.